Pretend you’re hitting the slopes or catching a wave—in the air. 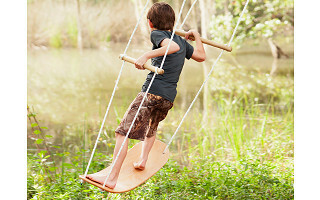 Swurfer is a standing swing designed to mimic the movement of board sports. It’s curved just like a surfboard or skateboard, with adjustable handles that add stability while you get into the swing of it. Made in the USA entirely from hard rock maple wood, the boards are super durable, and can really get moving in all directions. 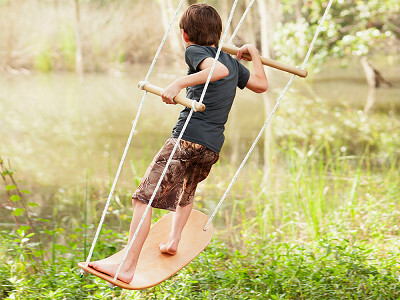 It’s just as fun to use as a traditional swing, too—just with a wider base. Founder Rob Bertschy created Swurfer for his own kids. He noticed them pretending to surf while watching him from the beach, and he created scaled-down boards so they could practice before graduating to the real thing. We recommend getting a professional to help you set up your Swurfer, to ensure you’ll have enough support and clearance. Once you’re up and swinging through the air, it develops balance and boosts confidence. But all kids will care about it is that it’s super fun. Hey, this is Rob, founder and creator of the Swurfer. Super stoked to be here virtually today, as I'm really in Charleston, South Carolina, where we design and manufacture all our Swingboards. Let's have some fun! his is Harriet. I would so love to have your swing,,,oops Swurfer. Just the gentle or intense exercise I am seeking. Being 80 years old, I'm thinking I could be happy with it. I am curious about the cost. and does it come with a frame? or must it be installed on trees? Please send me info. If it's not for me either space or price , you have one wonderful product going on here . @Harriet Thank you for the kind words. That makes my heart warm. The ideal way to install a Swurfer is on a nice, sturdy tree branch. You can also install it on a force using eye-bolts, under a deck, or even on a cable suspended between trees. It includes enough rope to hang up to 20 feet high. What age is this appropriate for and how does is it installed? @Marcia We recommend it for ages 6+. The installation is very easy, you don't even need a ladder. Our instructions that are included are very simple and you should be able to install and be Swurfing in a matter of minutes. @Rob Is there fear of going back and hitting the tree? My question is weight rating for individuals and since kids will be kids when you are not looking, I am sure they will test it! The board rating and the rope weight rating ?? @Lisa We rate the swing for 250lbs. The rope has a combined tensile strength of 10,500lbs. The description says the Swurfer should be installed by a professional. Who would that be? How high off the ground should this be hung? Does it need to hang down a certain distance from a branch to be able to swing too? @Allison Its always a good idea to have a certified arborist check out your branch to make sure its sturdy and healthy enough to support a swing. They will usually install the swing for you as well. Depending on whether you intend to sit on the swing and use it like a regular swing or not, you can install 12"-24" off the ground. It's best performance is when hanging from something at least 8 feet high. Could this be hung on a regular swing set frame? Or something similar that was cemented into the ground. I'm 65 and it looks so fun. @Patricia You can definitely turn your swingset into a swurfset! If your swingset already has a glider, this is the best way to attach so that you will be swurfing away from the swingset ends. Swurf's Up! Pretend you’re hitting the slopes or catching a wave—in the air. 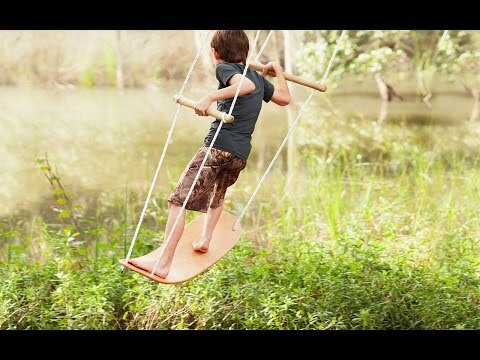 Swurfer is a standing swing designed to mimic the movement of board sports. It’s curved just like a surfboard or skateboard, with adjustable handles that add stability while you get into the swing of it. Made in the USA entirely from hard rock maple wood, the boards are super durable, and can really get moving in all directions. 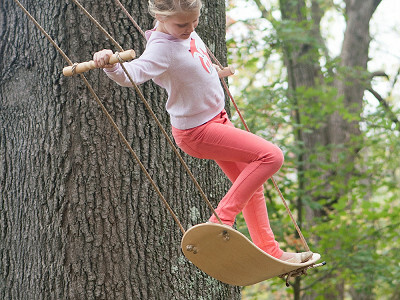 It’s just as fun to use as a traditional swing, too—just with a wider base. Founder Rob Bertschy created Swurfer for his own kids. He noticed them pretending to surf while watching him from the beach, and he created scaled-down boards so they could practice before graduating to the real thing. We recommend getting a professional to help you set up your Swurfer, to ensure you’ll have enough support and clearance.